We're so excited to offer this fantastic jacket to you! Classy and sassy, it is made of terrific silk and linen blended fabric which is comfortable and pleasing to wear. 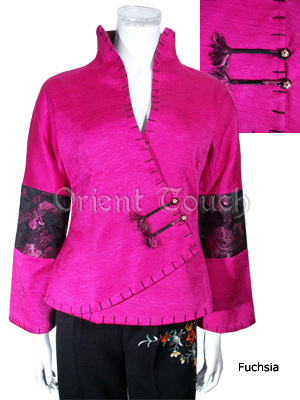 Patched with blessing floral patterned brocade at sleeves, it is also edged with contrasting-colored stitching, together with cloisonne frogs which are specially designed to serve as a foil to reflect the decent and elegance of the jacket. Wear it everyday or for special occasions, it's up to you!